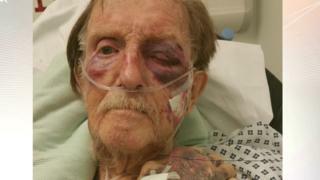 An elderly man who was "viciously" beaten and robbed in his own home has died. Arthur 'Bob' Gumbley, aged 87, was found lying on the floor at his home in Endwood Drive, Sutton Coldfield, on the evening of November 21. Four people have been arrested over the murder. Two men, 42 and 34, and two women, 33 and 29, from Birmingham have been arrested in the last 24 hours, and remain in custody. The robbery is believed to have taken place between 19:00 and 21:00 GMT as thieves stole jewellery and cash, as well as a purse that belonged to Arthur's late wife. Det Insp Dan Ison, said: "This was an horrific and despicable attack on a defenceless elderly man in his own home." "Crimes of this nature cannot go unpunished, and I want to reassure Arthur's family that every effort is now being made to bring those responsible to justice."